Can't say I had heard about this but I am glad I sold my DTR-T1010! 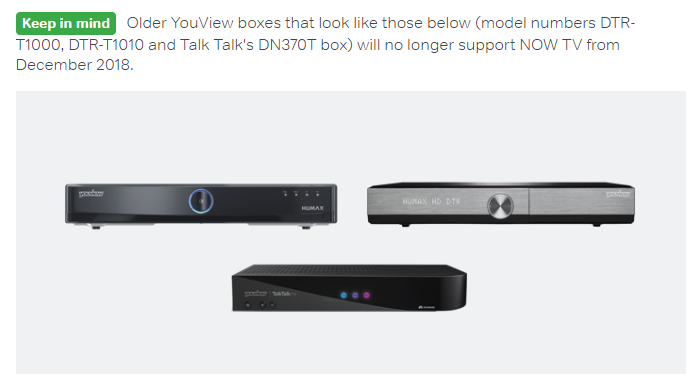 Keep in mind: Older YouView boxes that look like those below (model numbers DTR-T1000 or DTR-T1010) will no longer support NOW TV from December 2018.
so it does look like further boxes have been included in the list. It would be nice of YouView to make a statement regarding this as December is not that far away. A few weeks ago I found an email in my spam folder from Now TV. I had used it in the past on a T1000 and they were warning me about the change. I don't think I'll miss it. The older 2012 models T1000, T1010 and the Huawei DN370T aren't going get Amazon or Now TV as they are now outdated hardware. Though where Huawei is concerned they already have the full suit of SKY channels. Not quite a full suite, I think they are missing sky Atlantic. Sky Atlantic, Sky Witness, both not included. And what is life without GOTh? Exactly, the only channel I would really watch is Atlantic for GoT, so quite an important point....errmm. I wasn't having a go at you scott. So respect if you took it that way. As a few of you have already seen here, at the end of November, NowTV will update its Flash app to a new HTML version. This change means the app will no longer be supported on older YouView boxes. The affected devices are: DTR-T1000s, DTR-T1010s and DN370Ts. All other devices will be prompted to log in again. My old BT T1000 box give up the ghost a good few months back after about 4 years of use. I don’t know many that will still have the old T1000 Youview boxes. It was only a matter of time before older Youview boxes stopped supporting apps and major software updates. I now use a BT Youview box T2100 that BT gave me as well as a BT Youview 2110 retail box. @Louise have now TV provided youview with a fixed day this will happen?? Will it be the same restricted service that is currently on youview or will it be expanded to now TVs other services such at entertainment, sports or the live movie channels not just on demand. We will let you know the date of the change when we have confirmation, but the T1000s, T1010s and DN370s will not have use of the app as of the end of this month. This is the only change being made. I don't think the photo which accompanies the warning message is particularly helpful, the T1010 looks very similar to the T2000 and all TalkTalk boxes look the same. Would you rather have a list than thumbnails, then?